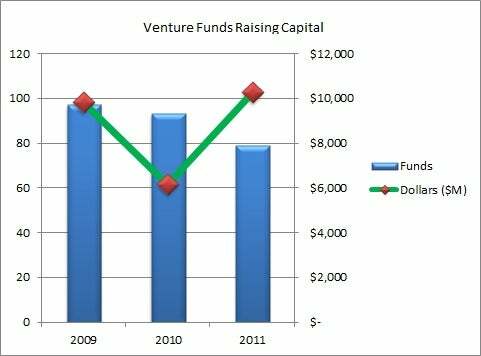 The numbers are out for venture capital fundraising for Q2 2011, and, according to the National Venture Capital Association (NVCA), the data confirms the queasy feeling that entrepreneurs raising money have felt in their guts this year. In Q2 2011, only 37 funds raised money, which is the 2nd lowest number in any quarter since the bubble burst in 2009. In Q3 2009, 34 companies raised money. 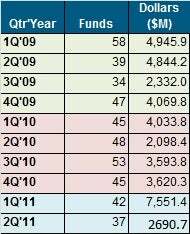 In terms of dollars, the 37 funds raised a total of $2.7 billion, well below the 42 funds that raised $7.5 billion in Q1 2011 and the 3rd lowest total since Q1 2009, edging out the $2.1 Billion raised in Q2 2010 and $2.3 Billion in Q3 2009. The first half of 2011 saw only a total of 76 funds landing new capital. That’s the lowest number of funds receiving inflows of cash since 1995. 1995? That’s, like, 3 bubbles ago? Let me try to relate what has changed since January of 1995. Back then, the first commercial Internet browser, Netscape, hadn’t yet gone public. Java meant coffee and google was only a word that babies said. The last time this few number of venture funds received money, Mark Zuckerberg, founder of Facebook, was 11 years old and the Rolling Stones were still touring….oh wait, the Rolling Stones are still touring today, so scratch that. The dollar value invested may appear healthy, yet entrepreneurial eyebrows should be raised as the traditional VC power centers of Silicon Valley and New York seem to be concentrating all the cash there and fewer VCs are getting funded. This may indicate that only the strongest funds with the best track records have money to invest. What that translates to for startups in a city like Washington DC, where only 0ne top 20 VC firm, New Enterprise Associates, has offices, is that it’s going to be harder to raise money at home. Besides NEA, in DC there are really only two credible, healthy firms that invest in technology startups – GroTech and Novak Biddle. The NVCA data did not single out which funds garnered cash, so we can only speculate. My sense is that the contraction of funds receiving capital will put control of VC financing in fewer and fewer hands, making raising capital more difficult for most companies outside of Silicon Valley. On the other hand, the numbers are positive for angel investors, who are seeing deals of higher quality then they were able to invest in the past.